A real live BB!!! PROOF!!!!. . Wallpaper and background images in the death note club tagged: death note another note l wammy bb. This death note Screencap might contain penerima televisi, televisi, tv, tv set, kotak idiot, tabung payudara, kotak goggle, tanda, poster, teks, and papan tulis. Thats so wrong. BB is standing in the spot where Mail is suppose to be. You can tell its faked. 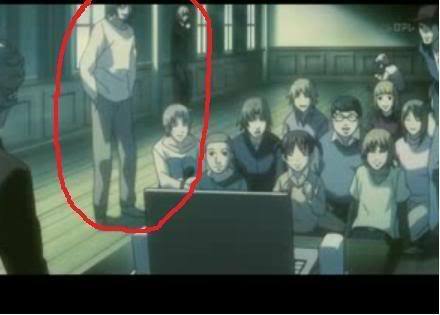 Look in the background, see Mello and Near? BB wasn't in Wammy's house at the same time Mello and Near were. Do you have any larger versions of this picture? This is not BB(sadly),on January 21st 2004, Beyond Birthday dies of a heart attack in prison, presumably one of the many criminals killed by Kira.So this is just a random Wammy kid. i agree with SirMailJeevas. bb wasn't with near and mello in wammy's house. and i thought bb wore a black shirt. Wha??? That so look like L O_o I don't get it! But he's quite adorable cause he look like L^^ L better!!!! Numb nut, If you look at the original of that, its matt, not bb. Sorry for shitting on your cornflakes. What or where is this from?